The 2014 Soul, Kia Motors America’s (KMA) compact car sales leader, has gained further recognition for its iconic design by being named to WardsAuto’s list of “10 Best Interiors of 2014.” Kia’s fun to-drive urban utility vehicle impressed WardsAuto editors by combining a refined interior design, high-quality materials, premium features, cutting-edge technology and value in the compact-car segment. “The totally transformed Soul is designed to retain all of the fun-loving appeal of the original Soul while incorporating more desirable premium amenities,” said Orth Hedrick, vice president, product planning, KMA. WardsAuto named the 2014 Soul to their list of “10 Best Interiors” based on a combination of fit-and-finish quality, safety, technology, design aesthetics and comfort. The 2014 Soul is offered in three trims and comes standard with steering wheel-mounted audio controls and SiriusXM®1 Satellite Radio1 and Bluetooth® wireless technology.2 Conceived at Kia’s U.S. design studio in Irvine, Calif., the all-new Soul’s design was inspired by the wildly popular Track’ster concept, which was unveiled during the 2012 Chicago Auto Show. Interior highlights include the use of soft-touch materials around the instrument panel, center console and door panels, and details such as available leather-trimmed seating and high-gloss piano black trim pieces on the center console and instrument panel add a premium feel without compromising the Soul’s fun and-funky style. 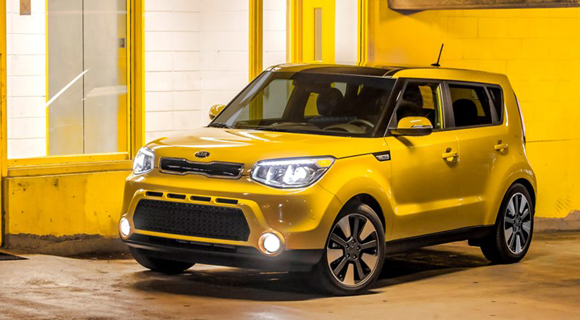 Instantly recognizable yet thoroughly fresh – with more than a passing nod to the hot Track’ster concept that was unveiled last year – the 2014 Soul rides on a new chassis that is stiffer, longer and wider. The Soul’s new dimensions allow for more passenger and cargo room while NVH levels have been reduced dramatically. Increased torque and significant suspension upgrades make the 2014 Soul a nimble and agile companion in congested urban environments and inside there is a long list of standard comfort and convenience features, including Bluetooth® wireless technology2 and steering wheel-mounted controls. 1 SiriusXM services require subscriptions, sold separately after 3-month trial included with vehicle purchase/lease. Subscriptions governed by SiriusXM Customer Agreement at siriusxm.com© 2014 SiriusXM Radio Inc. Sirius, XM and all related marks and logos are trademarks of SiriusXM Radio Inc.